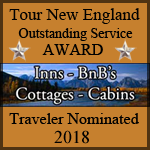 Welcome to TOUR NEW ENGLAND featuring the best inns and bed & breakfasts, resorts, motels, campgrounds, attractions and just about everything the area has to offer which allows you to make all of your vacation plans from one web location. If you’re planning a romantic getaway, imagine a vacation which includes mountain climbing in the morning, a relaxing afternoon at a fabulous ocean beach, a cozy dinner at an historic country inn, and a nightcap before retiring to a luxury hotel suite in the heart of a major metropolis…all in the same day! Or if you’re planning a vacation for the whole family, imagine the fun and excitement of satisfying everyone’s interests – swimming in a clear, cool lake…. In the winter, the skiing is world-class, rivalling Colorado and the Alps, and the cities are bustling with activities in the arts and entertainment. In spring, the flowers bloom and the forests and the farms come alive on a landscape dotted with flea markets as the antique shops hang out their “Open” signs. Summer means the beach! Hundreds of miles of major and secluded white sand beaches along the Atlantic coast. And inland, the music festivals and state parks will compete for your attention. And Golf…. And the fall foliage is the most spectacular on the planet. Visitors from all over the world travel to New England to view and photograph the turning of the leaves, stopping off to enjoy the many harvest-time festivities along the way. Connecticut, Massachusetts, Rhode Island, Vermont, New Hampshire and Maine make up the area so-named because it was the first destination for the earliest settlers for centuries. You can travel from the southwestern corner of Connecticut to the Canadian border at the northeastern corner of Maine in just a single day, and along the way, take in mountains, farmlands, historic villages, major cities like Boston and Providence, seaside fishing villages and beach resorts, and quiet, backroad detours through the cornerstone of the USA. And don’t forget that outlet shopping originated in the area and major discount shopping centers are sprinkled throughout each of the six states making for unparalleled savings opportunities! Our convenient links, maps, directories, etc. make it easy for price shopping and planning. Year after year, you can return to New England and never repeat a previous trip, or you may fall in love with one of the areas and make it a tradition! Just browse our website and you’ll quickly see why New England is the place to choose as your year-round entertainment and travel destination. And, once again, welcome to NEW ENGLAND!